On the walls of the third and fourth floor of Exley Science Center are massive, three-dimensional maps, dating from the 19th century, painted in peeling colors, and adorned with hand-written labels in an old cursive hand. One red and orange 3-D map displays pointy mountains in France; another, in lighter beiges and blues, shows the curves and fractures of the Grand Canyon. Despite their size and beauty, the maps are perhaps easy to ignore if you’re a student or professor who’s wandered these halls many times. But for geographer and relief model expert Melanie McCalmont, these maps are incredible relics and are part of the reason why she made the journey to Wesleyan this past week. McCalmont, a geographer specializing in relief models, three-dimensional maps that show elevation, came to campus from Monday, April 16 to Thursday, April 19. 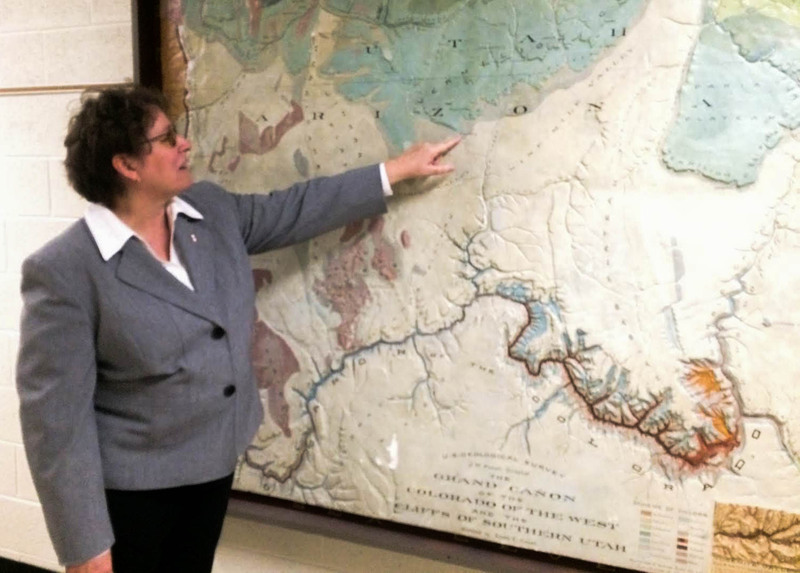 Over the course of her visit, McCalmont met with various members of the Earth and Environmental Sciences (E&ES) Department, gave a talk, and spent time pouring over the Wesleyan’s old records and maps. Her visit coincides with the current efforts to revitalize and reinstall pieces from the University’s old natural history museum, which was located in Judd Hall from 1871 to 1957. McCalmont’s interest lay primarily with the relief maps located on the third and fourth floor of the Exley science building. While we stood admiring the relief model of the Grand Canyon on the third floor of Exley, McCalmont explained that her entry into the world of relief mapping was a bit unorthodox. One of McCalmont’s favorite aspects of relief models is their palpability—the fact that they can be touched and handled, the groves followed with a finger. This, says McCalmont, gives the 3-D maps something digital maps lack. McCalmont is currently writing a biography of Edwin E. Howell, a prominent relief modeler who lived between 1845 and 1911. Howell was the main person who elevated the practice to an art and made prolific relief models in America in the 19th century. Howell has a strange connection to Wesleyan in that he worked for his brother-in-law’s company, Ward’s Natural Science, which was the supplier of the Orange Judd Museum of Natural History. In July of 1970, Judd signed the contract to obtain Ward’s collections for the Natural History Museum. From November 31 through December 31 of that year, Judd and his team helped to set up the collections, including the Glyptodon that is currently on display in front of the Science Library. The group then came back in March of 1971, and again in May, and between that time the collection was fully assembled, and the museum was born. McCalmont explained that in her research of Howell, via the many diaries she has been transcribing, she discovered many references to Middletown, Conn. She looked the city up and found Wesleyan. After researching a bit, McCalmont discovered that Wesleyan was in the midst of a revival of its old museum. She promptly decided to come down, offering to give a talk in exchange for a chance to look at Wesleyan’s collections. On the Grand Canyon relief model, the name “J.W. Powell” is written in proud letters near the bottom. McCalmont also explained the connection between Powell and Howell (other than the name similarity), noting that the two were involved in mapping adventures. McCalmont also described the major influence behind the Grand Canyon model, which happened to be one floor above. “Howell got the idea to build this from the French model that’s back upstairs,” explained McCalmont, referencing another model located in Exley that displays mountains in France. The French relief model was made in 1838 by a geologist named George Poulett Scrope. “One of the most unfortunate names in science,” McCalmont said of Scrope’s surname. Scrope’s purpose with the creation of this French map was to demonstrate the ways in which magma can form—to show that it doesn’t simply flow out of a volcano in the form of lava but can coagulate in magma chambers beneath the surface of the earth. This map helped to demonstrate the geography and geology of this area in a tangible and straightforward way. McCalmont also explained that these relief models are, in their own ways, forms of virtual reality. Rather than writing about a place in words, maps can transport and envelope a viewer. The maps were intended to be massive so that an interested person, standing close enough, would have her entire view obscured by the map. This was an intentional decision, a way to transport a viewer to the place. She additionally described the process of creation of these maps. Howell would take contour maps of the region of interest and blow them up to the size that he wanted. This was a complex process. A lithographer would have to take a photograph of the map and draw by hand. Then Howell would use plaster to form the 3-D map along the contours, using pins to mark relative heights. The map was then smoothed over in clay. A negative would be made, and the negative would then be used to make copies, which were each painted and then distributed. Later that afternoon, McCalmont gave a talk to a collection of Wesleyan University students and staff, most of whom were members of the E&ES department. Over the course of the talk, she described the history of relief mapping within its proximity to Wesleyan and also commented on the value of the objects in Wesleyan’s collections as learning tools. She pointed to a curved map of America, as located in the Joe Webb Peoples Museum on the fourth floor of Exley as a means of understanding the curvature of the earth. “It’s the tactile dimension of these things that makes the information so much stronger,” she said. And it’s true—after speaking with McCalmont, I found myself tracing the relief maps as I walked by them, imagining the depths of the canyon, the heights of the mountains, and the hands that made these geographic features come to life.